Who Else Wants A Fair Loan Locally--In Half The Time? Help your mom and dad get tax-free income from their home with a reverse mortgage home annuity. Our Local network of professional lenders provide a wide range of lending solutions including home loans, refinancing options, or home equity loans with flexible options and competitive rates. Your first job was: Truck Wash -- Washing big rigs at the age of 13 with my father. Professional training: Journey Mortgage Concepts of Mortgage’s, High Trust Sales and Professional Ethics Training. Did you or do you have a mortgage mentor? My long time friend and boss, Joe Southern. What does a premier lender do on the weekend? Family time when not doing open houses and applications for my customers. When I cook at home I like to...: Experiment on the grill with different recipes for Cajun Steaks, Chicken and Mexican dishes. One thing every consumer should keep in mind when searching for a mortgage: Make sure your credit is in check and always look at buying within your means. Don’t forget about other costs of homeownership besides the mortgage payment. What is the most gratifying part of Lending? 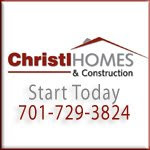 Helping Homebuyers get into that Dream Home. Your Favorite Charity and why?”Make-A-Wish… Helps kids achieve there dream going to a theme parks or meeting there favorite sports athlete. * Help your mom and dad get tax-free income from their home with a reverse mortgage home annuity. OreginalDesigns.com: Let Us Help You Save Money. FargoPrint.com is an online printing market that offers businesses and professionals complete e-commerce services to independently create and sell a wide variety of products, and unique merchandise. 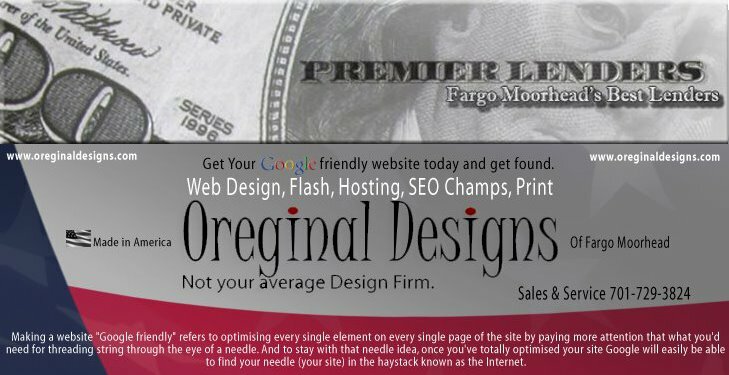 OreginalDesigns.com was launched online by a local group of business professionals, no other specifics were given. The group said in a press release, they started the online printing market after they collectively saw an increase in their print and design orders outside the Fargo-Moorhead area. The printing and design site allows the group to offer their services to anyone with online capabilities. orders. Prices start at $9.99 and print products range from business cards to flyers, brochures to custom magazines. The group states their mission is to create a brand on a budget for companies and professionals of all sizes using the unique print-on-demand and e-commerce services. Local delivery is included in the final prices. The site also allows home-based businesses and professionals to link up to their market-portal. The site powers independently-run shops as well as syndicated and corporate stores, ability to do business online, including storefront development, site hosting, order management, fulfillment, secure payment processing, and quality customer service. Businesses can open a free shop with no upfront costs and no inventory to manage, according to the press release. Once you know your middle credit score, look for a lender appropriate to your specific needs. When ready to make offers to purchase, apply for credit with lenders. Choose at least three lenders to apply with and do it at the same time. Call all your prospective lenders during the same week. This counts as only one inquiry on your credit report. Credit bureaus expect borrowers to shop for a loan. The best way to find a good lender in fargo is to ask a real estate investor or for a referral. Also, escrow officers and real estate agents know lenders who close loans efficiently in a timely manner. Avoid advice from agents or others who receive a kick-back commission for referring you, because you may pay for this referral with added charges to your loan. Ask potential lenders about the following requirements and costs according to a price range you think matches your needs. This also helps determine what you need to look for in a property. Are loan costs added to loan or prepaid? Is the seller allowed to pay a percentage of nonrecurring closing costs for the borrower? What is the maximum allowable seller contribution? Percentage of purchase price required down? Or loan to value ratio? What about the condition of the property? Do they finance "fixers"? After you work through all the details of the lender's checklist, you understand better the available possibilities. Now, from a different point of view, work backwards. Instead of asking the lenders what they offer you, tell them what you want and find the lender who best matches your terms. Create your own wish list of your personalized loan needs. Is this purchase an owner-occupied or an investment property? What percentage do you want to put down? If you want to sell right away, can you avoid prepayment penalties? Do you need the loan to finance a fixer? How much of a fixer do you want to tackle? How flexible are the lender's appraisers? Do you need a cooperative appraiser? Do you care about "garbage fees" and need costs to be added to the loan? Do you want to pay PMI, or a first and a second, or neither? Do you want the seller to contribute to your closing costs? How much do you want the seller to contribute? How many points do you agree to pay up front or add to the loan? Are super low payments available? Make your own checklist according to your abilities and find the lender who comes closest to your needs. Remember, a good mortgage broker wants your business and works hard to find the right loan out of thousands to best suit your requirements. However, asking a lender for impossible demands wastes your time and theirs. Notice the difference in real estate loan requirements, loan costs, and lender's attitudes. Figure out your qualifications, your loan needs, and find a matching lender with first-class service.